This Christmas we're supporting the Medway Winter Night Shelter help the homeless in Rochester, Chatham and across Medway. The Medway Winter Night Shelter is a project run by Medway churches and the Strood Community Project to help homeless people with a connection to Medway during the coldest and most difficult time of the year. It was set up in October 2015, and opened again at the beginning of January 2017 and ran until the end of March, with a twelve-bed shelter supported by over 170 volunteers. We’re donating our design and marketing services to help create collection boxes that will be distributed in shops, bars and restaurants in Rochester and Medway. 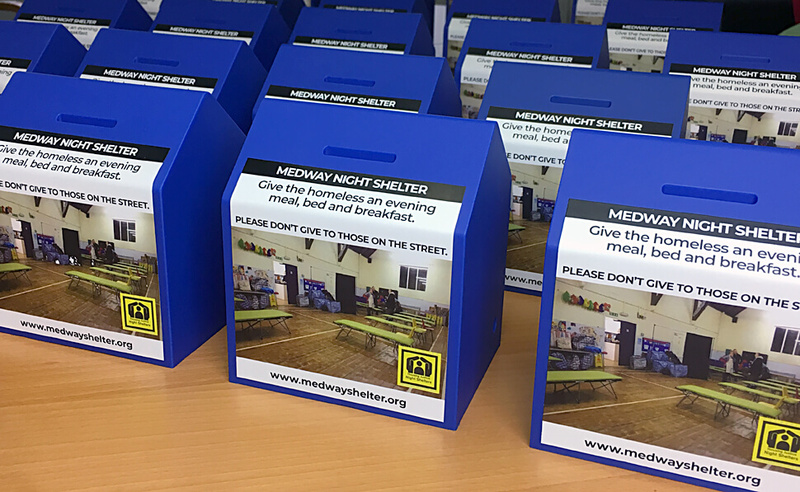 Monies collected by the Medway Winter Night Shelter boxes will help give the homeless an evening meal, bed and breakfast over the winter months. Visit The Medway Winter Night Shelter.